In this much-awaited sequel to bestseller ‘Moon Rabbit’, Steve finds himself back in Ancient China, on a terrifying quest to rescue Maisie from the clutches of the evil Monkey King and the curse of the Jade Snake. Continuing the work of ‘Moon Rabbit’, ‘Monkey King’s Revenge’ tackles themes of friendship and diversity. It tells a fantastic tale at once dark and humorous, combining English cultures with Chinese mythology. 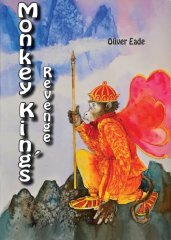 The author, Oliver Eade is a writer of short stories, novels and drama. He lives in Scotland and regularly visits his wife’s relatives in China. ‘Moon Rabbit’, November 2009, is his bestselling debut children’s novel. The illustrator, Alma Dowle has been an art teacher in schools over many years and is an experienced children’s illustrator. it is a very good book and the main character is called Maisie. If you have read Moon Rabbit, you won't be disappointed with Monkey King's Revenge. Loved reading this with my 9 year old son. He thinks there should be a Monkey King cartoon animation!! I love how the characters come alive and really stick in your mind - colourful pictures really help. What a wonderful story! My kids really loved reading this book together. They got hooked on Moon Rabbit the first book and were so excited trying to guess what would happen in the Monkey King. They talked it about a lot during the day waiting for bedtime to come around to get back to the story. Definitely captured their imaginations. The illustrations really bring it alive and we loved the ending. A perfect sequel for his previous title Moon Rabbit. Love both. What a great story! Kids will love this - a fun adventure with really exotic characters and fabulous illustrations. Beautiful illustrations supporting a rich, intriguing and magically written book. Always wonderful to learn about foreign history through soulful stories. A delightful story, subtly and beautifully told by a master. I think that this book is amazing! It is really interesting and also educational.